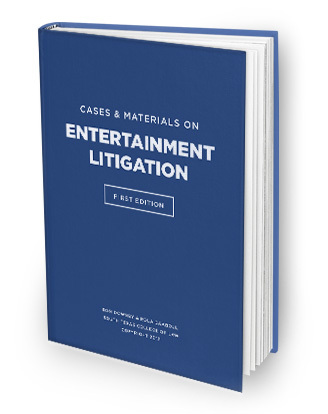 Judge Downey has written a new casebook – “Cases and Materials on Entertainment Litigation” – for use in teaching his entertainment law class at South Texas College of Law. As the name suggests, the book focuses on the litigation of issues related to entertainment, particularly music. Topics addressed include copyright, trademark, the rights of publicity and privacy, and contract and constitutional issues among many others. The cases involving copyright claims concerning music are followed by the competing songs so that the reader can hear both and compare their similarity. For a complete overview of material covered in the book, see the full table of contents – now available for download at the link below. Sign up to receive additional excerpts and updates on availability.